Why Be Curious? Perricone is native to northwest Sicilia and arguably every bit as important and interesting here as Nerello Mascalese is around Mount Etna on the eastern part of the island. 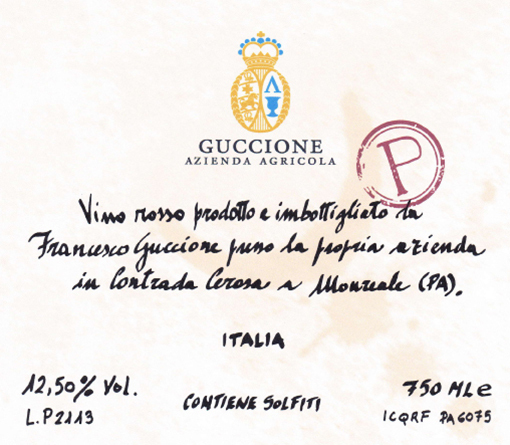 Maybe it’s the terre brune, a rusty-brown terroir of clay, chalk, and iron, or the arid but relatively mild climate, but Perricone has emerged as the secret treasure of this corner of Sicilia in general and of Guccione in particular. It’s savory, dark, and endlessly beguiling. Il Vino / The Wine: Dark red fruits with a floral note and the hint of bitter cherry that characterizes many of Italy’s best and most distinctive red wines. (Recent research suggests a parent-offspring relationship between Perricone and Sangiovese.) Delicious and captivating — one of the notable red wines of Sicily. Zolfo / Sulphur: 63 mg/L total, 22 mg/L free.